The Neapolitan Mastiff has a wrinkled face whose wrinkles go under its chin to its neck forming a prominent dewlap. Neapolitan Mastiffs are born with blue eyes that eventually darken. This breed has a low flat skull and a large nose. The strong silent Neo generally comes in dark blue or black. The Neapolitan Mastiff originated in Italy. Male Neapolitan Mastiffs 26 to 30 inches (65 - 75 cm). Female Neapolitan Mastiffs 24 to 28 inches (60 to 70 cm). Neapolitan Mastiffs can weigh up to 165 pounds (74 kg). 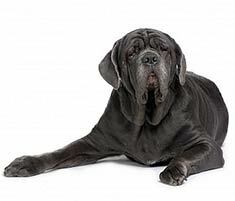 The Neapolitan Mastiff comes in blue, black and sometimes chocolate. The Neo can be either solid or brindle. An average shedder the Neapolitan Mastiff requires regular brushing to keep its coat healthy. No longer bred as a fighting dog, the Neapolitan Mastiff is gentle and kind to those he knows but wary of strangers and will ruthlessly guard his house and family. Calm and quiet, this serious breed is a heavy drooler and a hefty eater. The Neapolitan Mastiff requires a firm but calm and confident trainer. This breed does well with children. Neapolitan Mastiffs are susceptible to hip dysplasia, pano-ostiosis (growing pains) and cherry eye. The Neapolitan Mastiff only lives up to 10 years. Neapolitan Mastiffs should not be over exercised as puppies. As adults they require walks twice daily. This breed requires warm, soft bedding to sleep on that will not give it pressure markings. In hotter weather, the Neo requires lots of shade and fresh water. Neapolitan Mastiffs are not recognized. Find Neapolitan Mastiff Puppies with our Free Breeder search!